Properties that are common to all distributions are accessed via non-member getter functions: non-membership allows more of these functions to be added over time, as the need arises. Unfortunately the literature uses many different and confusing names to refer to a rather small number of actual concepts; refer to the concept index to find the property you want by the name you are most familiar with. Or use the function index to go straight to the function you want if you already know its name. 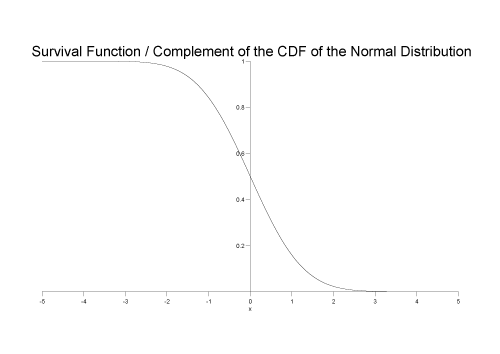 Complement of the Cumulative Distribution Function. Quantile from the complement of the probability. The Cumulative Distribution Function is the probability that the variable takes a value less than or equal to x. It is equivalent to the integral from -infinity to x of the Probability Density Function. This function may return a domain_error if the random variable is outside the defined range for the distribution. The complement of the Cumulative Distribution Function is the probability that the variable takes a value greater than x. It is equivalent to the integral from x to infinity of the Probability Density Function, or 1 minus the Cumulative Distribution Function of x. This is also known as the survival function. See why complements? for why the complement is useful and when it should be used. Returns the Hazard Function of x and distibution dist. Some authors refer to this as the conditional failure density function rather than the hazard function. Returns the Cumulative Hazard Function of x and distibution dist. Some authors refer to this as simply the "Hazard Function". Returns the mean of the distribution dist. This function may return a domain_error if the distribution does not have a defined mean (for example the Cauchy distribution). Returns the median of the distribution dist. Returns the mode of the distribution dist. This function may return a domain_error if the distribution does not have a defined mode. For a continuous function, the probability density function (pdf) returns the probability that the variate has the value x. Since for continuous distributions the probability at a single point is actually zero, the probability is better expressed as the integral of the pdf between two points: see the Cumulative Distribution Function. For a discrete distribution, the pdf is the probability that the variate takes the value x. Returns the valid range of the random variable over distribution dist. 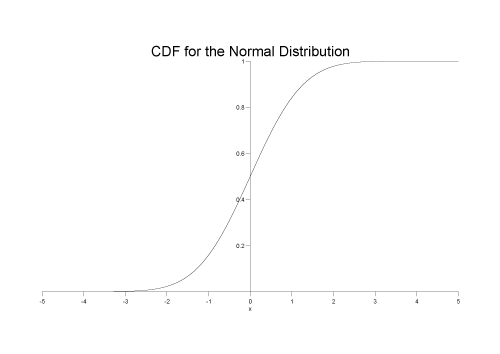 The quantile is best viewed as the inverse of the Cumulative Distribution Function, it returns a value x such that cdf(dist, x) == p.
This is also known as the percent point function, or percentile, or fractile, it is also the same as calculating the lower critical value of a distribution. This function returns a domain_error if the probability lies outside [0,1]. The function may return an overflow_error if there is no finite value that has the specified probability. The function computes a value x such that cdf(complement(dist, x)) == q where q is complement of the probability. This function is also called the inverse survival function, and is the same as calculating the upper critical value of a distribution. This function returns a domain_error if the probablity lies outside [0,1]. The function may return an overflow_error if there is no finite value that has the specified probability. Returns the standard deviation of distribution dist. This function may return a domain_error if the distribution does not have a defined standard deviation. Returns the supported range of random variable over the distribution dist. The distribution is said to be 'supported' over a range that is "the smallest closed set whose complement has probability zero". Non-mathematicians might say it means the 'interesting' smallest range of random variate x that has the cdf going from zero to unity. Outside are uninteresting zones where the pdf is zero, and the cdf zero or unity. Returns the variance of the distribution dist. This function may return a domain_error if the distribution does not have a defined variance. Returns the skewness of the distribution dist. This function may return a domain_error if the distribution does not have a defined skewness. Returns the 'proper' kurtosis (normalized fourth moment) of the distribution dist. Where μi is the i'th central moment of the distribution, and in particular μ2 is the variance of the distribution. The kurtosis is a measure of the "peakedness" of a distribution. Note that the literature definition of kurtosis is confusing. The definition used here is that used by for example Wolfram MathWorld (that includes a table of formulae for kurtosis excess for various distributions) but NOT the definition of kurtosis used by Wikipedia which treats "kurtosis" and "kurtosis excess" as the same quantity. This subtraction of 3 is convenient so that the kurtosis excess of a normal distribution is zero. This function may return a domain_error if the distribution does not have a defined kurtosis. 'Proper' kurtosis can have a value from zero to + infinity. Returns the kurtosis excess of the distribution dist. The kurtosis excess is a measure of the "peakedness" of a distribution, and is more widely used than the "kurtosis proper". 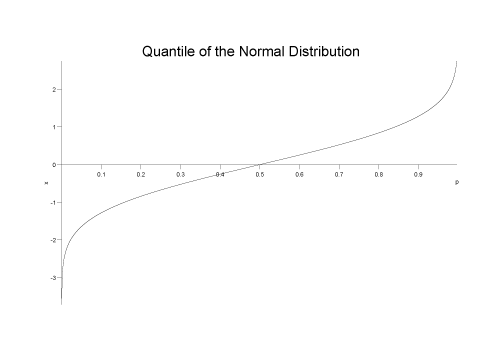 It is defined so that the kurtosis excess of a normal distribution is zero. This function may return a domain_error if the distribution does not have a defined kurtosis excess. Kurtosis excess can have a value from -2 to + infinity. 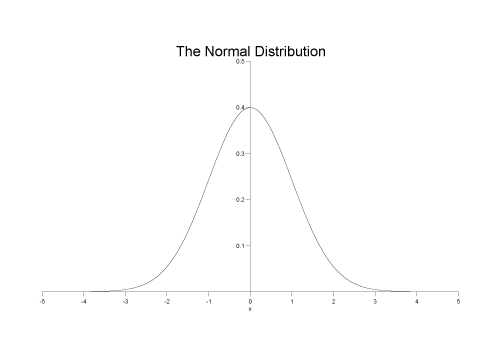 The kurtosis excess of a normal distribution is zero. The terms P and Q are sometimes used to refer to the Cumulative Distribution Function and its complement respectively. Lowercase p and q are sometimes used to refer to the values returned by these functions. The percent point function, also known as the percentile, is the same as the Quantile. The inverse of the cumulative distribution function, is the same as the Quantile. 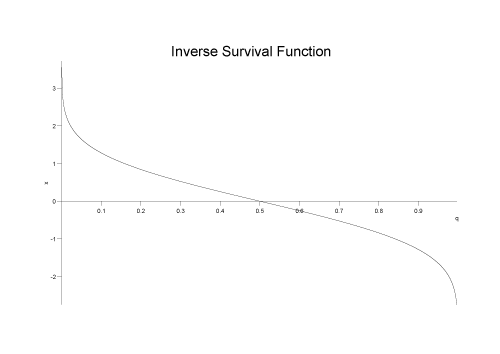 The inverse of the survival function, is the same as computing the quantile from the complement of the probability. The Probability Mass Function is the same as the Probability Density Function. The term Mass Function is usually applied to discrete distributions, while the term Probability Density Function applies to continuous distributions. The lower critical value calculates the value of the random variable given the area under the left tail of the distribution. It is equivalent to calculating the Quantile. The upper critical value calculates the value of the random variable given the area under the right tail of the distribution. It is equivalent to calculating the quantile from the complement of the probability. Refer to the Complement of the Cumulative Distribution Function.